The famous Przystawik family have been masters of the musical water and light fountain display for more than 70 years over three generations. We exclusively develop and construct music fountains, going from small-scale indoor store displays all the way up to large outdoor spectacles that ‘wow’ audiences in their thousands. Our commitment to excellence means that our clients are guaranteed exceptional quality and reliability. 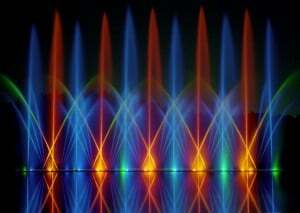 These dancing fountains are a family tradition and our family name depends on them being the best in the world. Our patented designs can be seen in some of the grandest settings including Universal Studios, Sea World and Disney. Liquid Fireworks’ beautiful fountains are graceful, entertaining, exciting and memorable; whatever you are looking to achieve with one of our displays, we can tailor each show to your requirements. We are internationally recognised as the leading experts in water, light and music productions, with space-age technology keeping us at the forefront of the industry. The impressive shows installed by our team are proven crowd pleasers and soon become popular local attractions once in place. Our level of expertise is unrivalled and we are confident that our light fountains will greatly benefit you and your business. They are the star of every show and because they require very little maintenance, they will never miss a beat. We are proud to provide clients all over the world with bespoke attractions that in many cases generate capital through admission charges. Any venue can be utterly transformed by having a stunning musical fountain installed and we can cater for indoor or outdoor venues.